I’ve written articles about the software development process for Better Software magazine and blogged for about a year at StickyMinds.com. My project experience has included products in the education, finance, consumer product reviews, job search, telecommunications, and manufacturing industries. For a brief period of my life, I worked as an audio engineer recording audio books in New York. I’m a music enthusiast and play the guitar for fun. From One Expert to Another: Steve Berczuk, an interview with Steve Berczuk about Software Configuration Management (SCM) published in CMCrossroads, April 29, 2013. From One Expert to Another: Daniel Wellman, an interview with me about Test-Driven Development (TDD) published in StickyMinds, December 31, 2012. "Alternative JVM Languages for Java Projects" in the September/October 2011 issue of Better Software magazine. "An Introduction to Scala" in the November/December 2009 issue of Better Software magazine. “Google Web Toolkit: Writing Ajax Applications Test-First” in the November 2008 issue of Better Software magazine. This article was adapted by the GWT team and included in the project's resources page. Improve your iOS Frank Cucumber Acceptance Tests from the Cyrus blog, covering the imperative and declarative styles of acceptance tests. "Mocking GWT Widgets with GWTMockUtilities"
I am the author of Bane, a test harness used to test your application's interaction with other servers. It is based upon the material from Michael Nygard's "Release It!" book as described in the "Test Harness" chapter. I speak to teams about software development issues with an emphasis on the technical practices and tools. Some of the topics include Test-Driven Development, Refactoring, Object-Oriented Design, Mock Objects, GWT, and Ruby on Rails. I have given these talks to developers at organizations such as Charles Schwab, Kaplan, and Skarven Enterprises, a Boeing company. I presented this talk at The New York XP & Agile Meetup. Here are the slides. 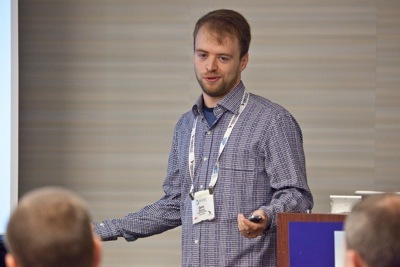 I co-presented "Agile AJAX: The Google Web Toolkit Experience" at the Agile 2009 conference with Paul Infield-Harm. This session introduced GWT and how it could be used in a team following agile development practices. Attendee feedback was positive, with consistent scores of four or five (out of a maximum of five) on the feedback forms. The session description, slides, sample code, and additional notes are available online.